Halloween brings out the kid in most of us. You can decorate on a budget for Halloween. 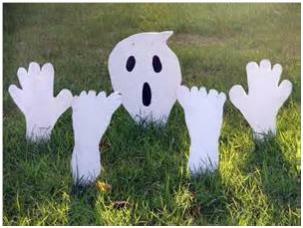 This classic Halloween decoration idea turns your yard into a creepy cemetery. Use reclaimed materials to create a free graveyard. To create your haunted cemetery, cut different shapes out of cardboard and paint them to look like aging tombstones. Once they dry, you can arrange them on the lawn to look like a miniature graveyard. 1. Flatten several shipping boxes. 2. Use a Sharpie to draw tombstone shapes. I made a few rectangular, cross, and oval tombstones to give my graveyard some variety. 3. Cut the shapes out of with a pair of scissors. 4. Paint the shapes a dark grey and allow the paint to dry. 5. Once dry, add on sayings like “R.I.P” to the front of each tombstone. Glue a wood or plastic yard stake to the back of the tombstone and plant it into the ground. By using real wood, you can partially waterproof the tombstones, so they last for more than one Halloween season. The project works best if you use thin pieces of composite wood, which you can buy at any home improvement store. The thin pieces are easier to cut and stand up better in the grass. Most of these craft projects use reclaimed materials or items you already have in your home. You just need a few tools, some supplies, and your imagination to have a spook-tacular Halloween this year. 1. Purchase an artificial pumpkin from a hobby store. 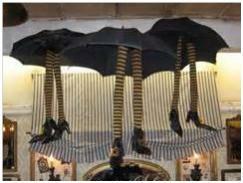 They come in several different shapes, colors, and styles, so pick one you think will look best at your front door. 2. 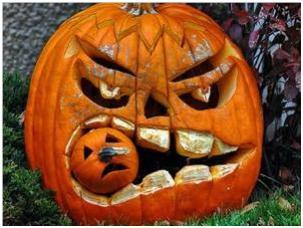 Use an Exacto knife to carve a small hole in the bottom of the pumpkin, and to create a design on the front. 3. After you finish the design, use a small piece of sandpaper to gently sand down any rough edges. 4. Place a small flashlight or electric candle in the bottom to make your design glow, and pop your Jack o’ Lantern on the front porch. 5. If you use small reusable jack o’ lanterns, you can place them in the windows of your home, to cast an eerie light on your front yard. Fill a plastic glove with tissue paper, popcorn, or small shredded paper waste. You can also open up the gloves and fill them with freshly mixed JELL-O, for jiggly, realistic-feeling hand. Tie the open end of the glove with a clear elastic band to secure its contents. You can create a ghost-lit walkway that your trick-or-treaters will love. Look online to get inspirations for designing your ghosts’ faces. 1. For this project, you need several milk jugs, some black construction paper, and enough artificial candles to fill the jugs. 2. Wash and dry each milk jug. 3. Once dry, use a knife to cut a small hole in the bottom of each jug. 4. Make ghost faces for each jug by cutting out a pair of eyes, a nose, and a mouth from the black construction paper. 5. Turn the jug so that the handle faces the back. Glue the faces onto the front of the jug and place an artificial candle inside. 6. Line the jugs along your walkway and turn the candles on. The jugs light up, illuminating the faces. You can convert a table into a scientist’s lab. By tossing just about anything you can imagine into a glass jar with some food coloring, you can quickly create a cheap Halloween decor piece. Make the jars seem even creepier by using mood lighting. 1. Collect a few glass jars in different sizes, such as mason jars, spaghetti jars, or baby food containers. 3. Fill the jar with water and drop in two drops of food coloring. The food coloring will make the object look like a specimen.